The National Academy of Sciences just released a new book, Science, Evolution, and Creationism, which “provides information about the role that evolution plays in modern biology and the reasons why only scientifically based explanations should be included in public school science courses” (p xi). Available as a free pdf, the 86-page document is aimed squarely at educators, policy makers, and the lay public, and explains that accepting evolution does not preclude belief in religion. The anti-evolution, pro-intelligent design Discovery Institute issued this predictable reply, despite the book’s clear assertions and supporting evidence that “‘intelligent design’ creationism is not supported by scientific evidence” (p 40) and “attempts to pit science and religion against each other create controversy where none needs to exist” (p 12). Committee members who oversaw production of the book include Francisco J. Ayala, past president of the AAAS; Neil deGrasse Tyson, director of the Hayden Planetarium at the American Museum of Natural History; and Science Progress advisory board member, former NAS president, and recently-named Editor of Science Bruce Alberts. The National Academy of Sciences just released a new book, Science, Evolution, and Creationism, which "provides information about the role that evolution plays in modern biology and the reasons why only scientifically based explanations should be included in public school science courses" (p xi). Available as a free pdf, the 86-page document is aimed squarely at educators, policy makers, and the lay public, and explains that accepting evolution does not preclude belief in religion. The anti-evolution, pro-intelligent design Discovery Institute issued this predictable reply, despite the book's clear assertions and supporting evidence that "'intelligent design' creationism is not supported by scientific evidence" (p 40) and "attempts to pit science and religion against each other create controversy where none needs to exist" (p 12). 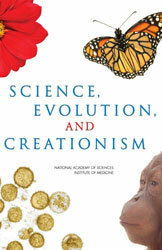 Committee members who oversaw production of the book include Francisco J. Ayala, past president of the AAAS; Neil deGrasse Tyson, director of the Hayden Planetarium at the American Museum of Natural History; and Science Progress advisory board member, former NAS president, and recently-named Editor of Science Bruce Alberts.